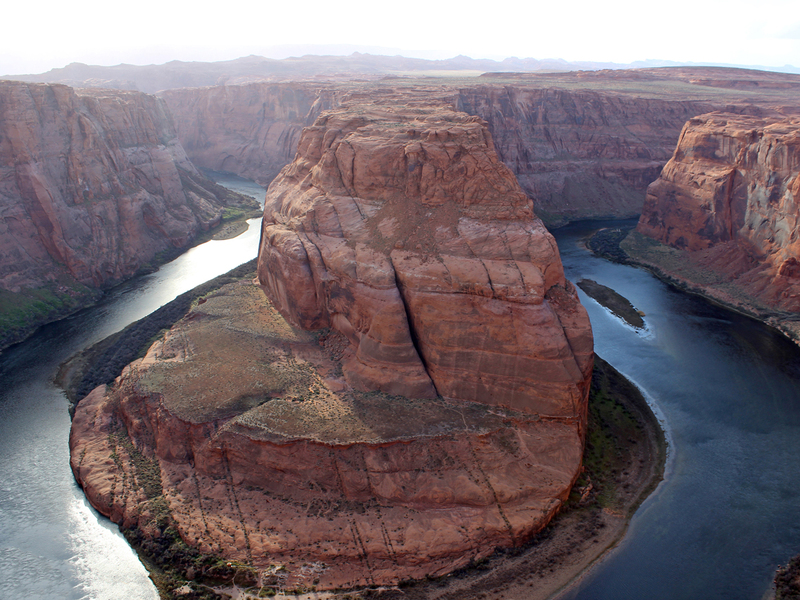 Enormous cliffs tower over the Colorado River, as it makes a hairpin turn around Horseshoe Bend. At less than a mile long, the blustery, sandy hike to Lookout Point is an easy one. 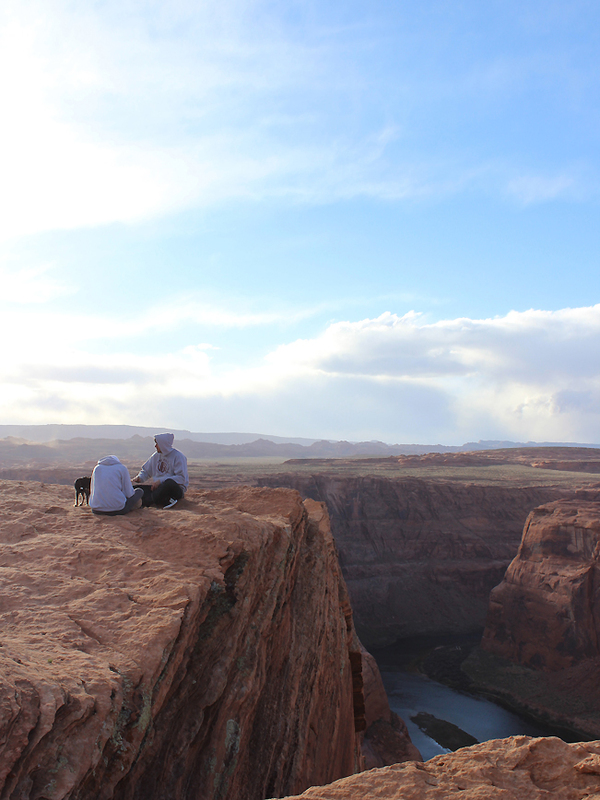 And the mind-bogglingly spectacular views to be had from the 1000′ high, heart-palpitating rim, are beyond words beautiful! No matter how many pictures you’ve seen of this spectacular spot, the phenomenal experience of standing on the soaring rim of Horseshoe Bend and looking down at the Colorado, twisting and turning below, really can’t be overstated! 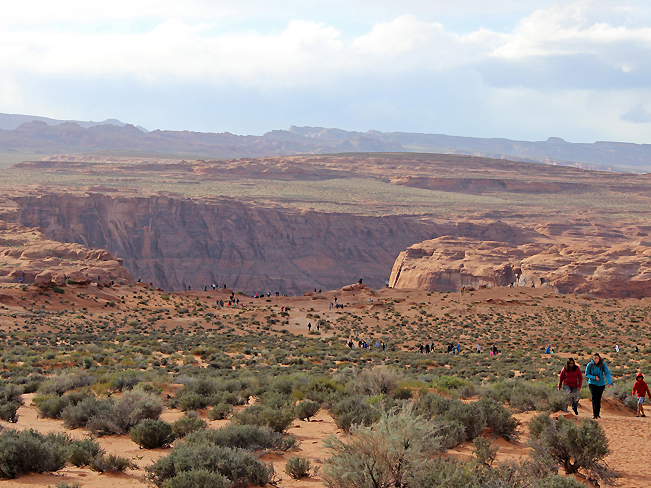 The hike is an easy one, and yes … quite popular! Throngs of people travel from around the world to experience this exceptional place. From the trailhead, the hike ascends a small hill, passes a shaded seating area (with info on the area) and then veers right to descend a short, sand and stone path to the lookout. The rim simultaneously inspires awe, vertigo, exhilaration, and wonder. Cliffs drop 1000′ straight down, directly in front of the edge and there are no rails! So it is super important to keep kids close, if you have them. 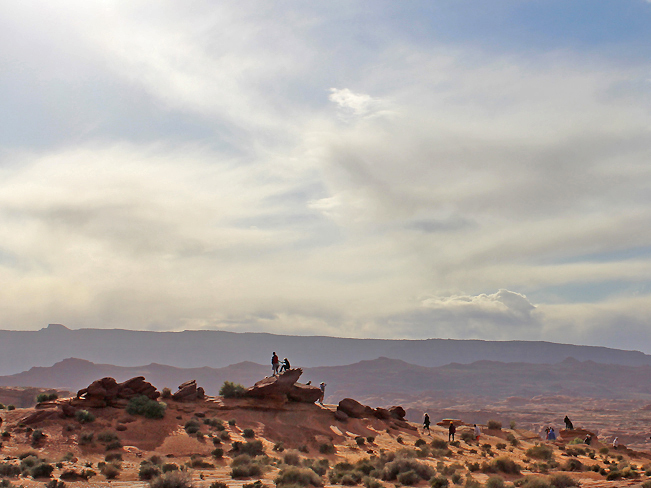 A number of large rock formations sit back on the plateau, and are a blast to climb on. And truly, no matter where you stand, you will be blown away by the endless views, ever changing light and color, incredible geography, and … wind. This is a uniquely amazing place! Moki Marbles and Erg are exotic features of the Horseshoe Bend Hiking Trail. Moki Marbles are the small, iron based spheres found on the plateau, which are released as the sandstone slowly wears away. Much of the sand that blows through the area is the remnant of a 200-million year old Erg (or sand dune sea). Add that word to your Scrabble arsenal! Click here for additional information about the area. Click here to seen drone footage by drone sc. Directions The well marked turnoff to the Horseshoe Bend Hiking Trail parking area, is located on the west side of US 89, approximately four miles south of Page, or 126 miles north of the intersection of US 89 and I-40 in Flagstaff.